1 I.e. 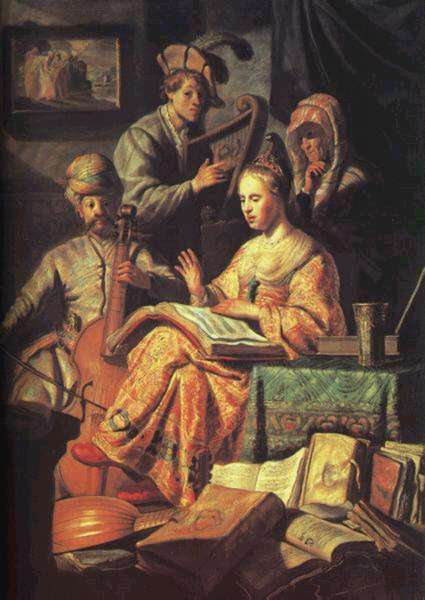 music derived from European traditions. With occasional exceptions, in the vast world of 'popular' music, 99.99% of what you hear is pure western music (even in other parts of the world). This should not be confused with 'Country-western,' although that certainly falls within the category. 2 Pipe organs can go both higher and lower than a piano, and MIDI (see Software) defines notes more than an octave above and below, beyond 'normal' hearing range. 3 I have discussed the physics in the chapter on 'Waveforms and harmony,' but if you are new to all this, I would recommend waiting until later for that. 4 Of course, the term octave assumes the traditional sub-division discussed in the next paragraph, but the phenomenon is built into the nature of sound (see Waveforms and harmony). 5 Ancient Greeks used letters for numbers, so the number-name vs. letter-name issue, which we will encounter later, would probably not have occurred to them. 17th century rock band trying to learn a song their manager (looking on) thinks would be good for their image. (Rembrandt - The music party, 1626). Western music1 has certain basic features which we should address right at the beginning, although I realize that if you are coming to a site about 'music theory,' you almost undoubtedly already know this stuff, or at least intuit it from what you have heard. So you are welcome to skip this part if it seems overly simplistic. Tradition sub-divides those octaves into uneven divisions of seven notes each which we call scales. There are different ways of dividing up the octave, and so there are different scales, which we will unpack further down the road. Most music you hear likes to stay close to these scales most of the time, but there are actually 12 different notes to choose from. The seven note scales are called 'diatonic' ('through the notes') scales. The twelve-note subdivision is called a 'chromatic' ('colorful') scale. Some, particularly 20th century, music actually uses chromatic scales, but most people don't find it very pretty, so diatonic music still dominates the popular world. The one caveat is that composers will often temporarily wander out of their diatonic limitations to include chromatic embellishments. These provide interest. As we progress, we will see how this works. The way we name notes reflects the diatonic dominance. From very early times notes have been given the titles 'a' through 'g,'5 after which we start over at the octave (eighth note). If we want to refer to one of the other notes from the chromatic scale, we name it relative to the diatonic scale. If up a note we call it 'sharp'; if down a note it is 'flat.' Such note alterations are called 'accidentals' ('non-essential,' or 'unexpected'). This going to get confusing quickly without practical application, so I am going to ask you to move on to music notation at this point. One thing I am going to suggest right away, though, is that if your instrument is something other than a keyboard (piano, organ, etc. ), you should get access to one (a kiddie-keyboard from the thrift shop should be fine, as long as it as it has a couple of octaves [including black keys], and works). You don't actually need to learn to play it, but it will make your life much easier making sense of these lessons.